Magnitude Matters: Will The Boomers Really Kill The Stock Market? Will The Boomers Really Kill The Stock Market? Last week listening to NPR I heard this story on Marketplace. Marketplace's shallow treatment of the story was frustrating although not atypical. The gist of it is a concern that as Baby Boomers age and enter retirement they will begin a mass sell off of the equity portfolios in favor of bonds or cash, etc. and that this activity will depress stock prices. This is a fundamental but understandable misapplication of supply and demand (SD). SD is different for capital investment assets. At the price I am willing to pay I will purchase stock in a company. If that price rises enough, I will sell. Hence, once I take ownership, I am a supplier. But if after I purchase the price goes down enough and I don't think fundamentally anything has changed, I will buy more. Hence, I am also a demander. This is a peculiar situation where the same entities are both suppliers and demanders. Normally, you're on one side or the other. Think of Wal-Mart and myself in the banana market. Wal-Mart is clearly the supplier and cannot realistically take the position of a demander no matter how low the price of bananas falls outside of using the bananas as an input for making, say, banana bread and then supplying that. (Wal-Mart can buy more to turn around and sell more, but it cannot actually consume bananas keeping it firmly on the supply side of the equation). Likewise, I cannot realistically become a supplier of bananas no matter how high the price of bananas climbs. (Sure, at some point it is profitable for me to drop the day job and take up a plantation south of Panama with David Lee Roth, but in what world does that happen and I am the guy best suited to do it?) So unlike in regular goods markets, SD clearly has some special properties when dealing with investment assets. Because most of the time only a small fraction of the total quantity of stock in a particular company actually trades, you need simultaneous and opposite shifts in SD to get a large price change. Conceptually this makes sense if many investors are thought of as both suppliers and demanders simultaneously--my increased interest as a buyer for a particular stock shifting demand to the right is mirrored by my decreased interest as a seller for that same stock shifting supply to the left. Figure 1 below demonstrates. 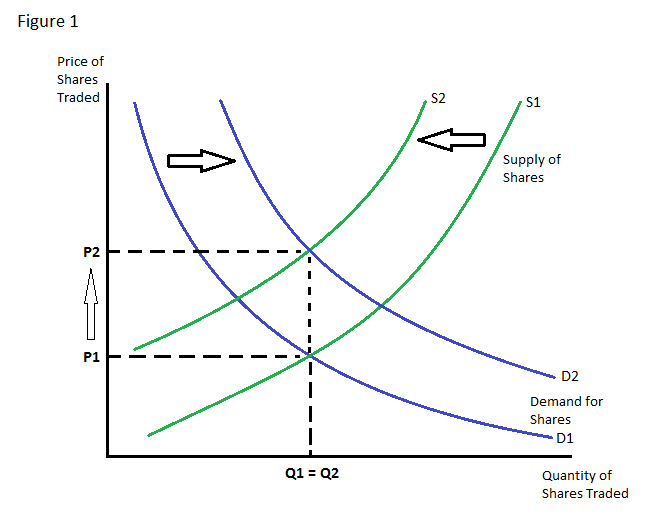 Perhaps a better way would be to look at the supply curve as fixed (vertical) at the point where quantity equals the total shares outstanding. The demand curve then does all the heavy lifting. 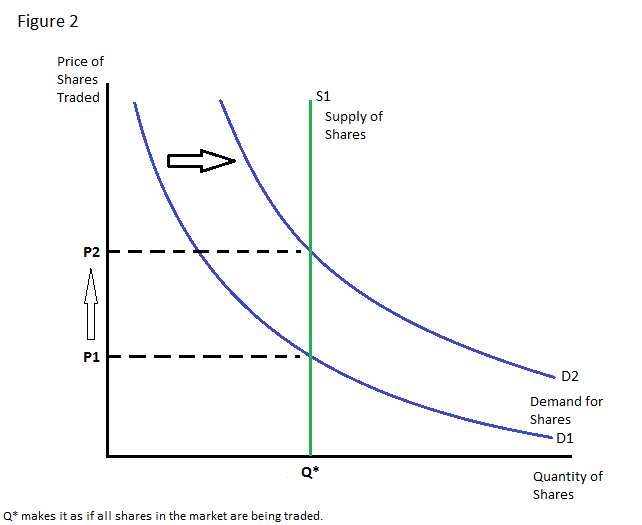 The supply curve only shifts when there is increased or decreased short selling or when the firm issues new shares to the market or removes shares from existence. Figure 2 below demonstrates. Absent a surprise change in the fundamental condition of a stock such as a new product success or a fire destroying inventory, what can actually affect a shift in demand (using Figure 2's modeling of the market)? New buyers of stock enter the market all of a sudden? How would that actually work? For example, imagine a rich, crazy man walks onto the NYSE trading floor (opens a Schwab account for you literalists). He wants to use his entire $10,000,000 net worth to buy Apple stock paying as much as double the market price although nothing has changed fundamentally for Apple. What happens to Apple's price? Well, it goes up, temporarily. What next? Well, what can he do with the stock once purchased? He can't destroy it. He can hold it. He can sell it. He can give it away. Regardless of the action he takes, the stock always goes back to the rational price. Here we have another case where we simply should insert the response "And then what?" It isn't enough just to make a vague assumption of a market outcome. One needs to have a basis for the outcome and then work through the possible consequences. The same applies to scare hypotheticals (circa 1985) "What if the Japanese buy up all the real estate in the U.S.?!?" or (circa 2014) "What if the Chinese buy up all our oil and gas and coal?!?" Same answer: Okay, and then what? Without something fundamentally changing in regard to a stock's value, a price change can only happen if risk tolerances* change. Consider a two-asset investment universe (riskier stock and less risky bond). A shift in the average appetite for risk will change the relative attractiveness of the two assets which will be realized through a change in price. If the average risk appetite increases, the riskier asset (stock) will increase in price while the less risky asset (bond) will decrease in price, ceteris paribus. Note that it is unclear in a more realistic many-asset universe how a change in average risk tolerance would propagate into changes in prices as risk is neither linear (one rate of change) nor singular (one-dimensional), but the principle remains the same. What could Baby Boomers actually do? IF they changed the average risk tolerance of investors, then you would tend to see a decline in more risky asset prices and an increase in less risky asset prices. This could mean a decrease in the price of equities. Yet this change in average risk desire is unlikely. It is not clear that people actually get that much more risk averse as they age. And to the extent that they do, growth in life expectancy and desires to bequeath partially offset any expected increase in risk aversion. Growth in population, which of course occurs at the bottom of the age distribution through births and near the middle through immigration**, will also tend to reverse any age-specific effects on average risk tolerance. This is the way to think through the situation to find a real path by which a group of market participants like Baby Boomers might affect prices. It is nuanced and fuzzy--two things that don't work well in a three-minute radio broadcast. *I am being quite liberal with the term "risk tolerances" here as I look to include many facets of taste and perhaps all of Lord Keynes "animal spirits". **This would only be referring to immigrants who were very disconnected from financial assets since otherwise they would already be a part of The Market, which is indifferent to dashed lines on maps and labels on passports.